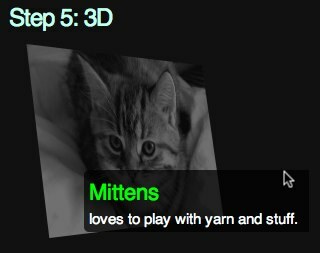 <strong>Mittens</strong> loves to play with yarn and stuff. 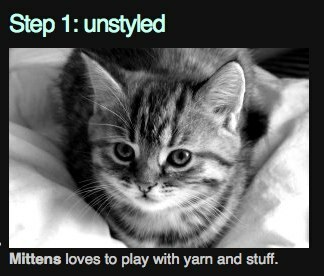 To make this smoother, all we need to do is to use CSS transitions on the images and the captions (Step 4). This transitions smoothly between the states without us having to do any calculations. In order to play nicely across browsers, we repeat the instructions with all browser prefixes and fall back to the non-prefixed version. Lastly, we do the 3D effect for browsers that support it (Step 5). For this, we give the list item a perspective of 800 pixels. This is like putting a cube into our document where we now can position elements in. In our case, we move the image on rollover 80pixels in the X axis, -20 pixels in the Y axis and -100px in the Z axis. We also rotate it 50 degrees in Y and 10 degrees in X.
Webinale – HTML5 und CSS3 fuer alle! Die Tonaufnahme des HTML5 talks gibt es bei Archive.org. 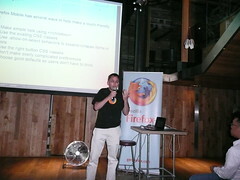 Yesterday night Mozilla invited developers to the Hub in King’s Cross, London to learn about Add-ons and the future of Firefox. This, according to Nick, makes the Mozilla stack the “richest extensions platform”. there’s a user friendly web IDE - the addon builder. Nick then explained some of the options for promoting your add-ons. Promotion is possible for targeted markets and promoted add-ons normally tend to get 5-10k downloads/day. Firefox 4 will have add-ons in a tab – full screen and featured instead of the currently somewhat cumbersome add-on manager. 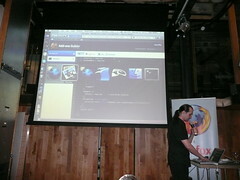 The Rock your Firefox blog describes the story of add-ons and how it improves people’s lives. It is an editorial servers for developers. Featured add-ons get 2-3 days exposure and ten-thousands of downloads. The Mozilla contributions program allows people to donate money for developers. So far 500 add-ons (12% overall) received money from the programme. It has run for 10 months and so far raised $90,000. The next step for Mozilla now will be an add-on Marketplace – which is a store for add-ons. They want to try it out and see how it will work out. In a survey conducted amongst the add-on developer community 3 out of 4 developers like the idea of reaching 100 million active add-on users and sell their add-ons for 1 to 5 dollars. 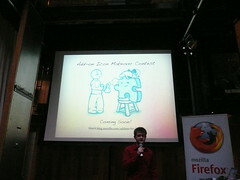 Mozilla is very outspoken about never to consider a DRM model and consider fair pricing the better way to fight piracy. The store will accept Paypal and all major credit cards. One of the key requirements is support for non US developers and the store encourages free add-ons that feature more options in the paid versions – much like the Android market does now. Overall Mozilla like to see their planned app store not like a mall but like an organic farmers market. Justin Scott talked us through some of the steps how to build a really good add-on and explained some of the pitfalls to avoid. 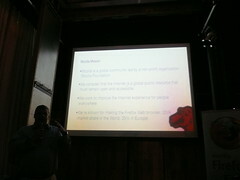 His talk was structured in three stages of add-on deployment: building, marketing and listening. If you for example click on a link in an email you don’t want your Firefox to open a different pages as an add-on needed upgrading. This was one of the main reasons why the new add-on manager in Firefox 4 will not pop up any longer but will be much more discreet. Don’t clutter the UI - instead try to integrate your extension with the UI as if they are a part of Firefox. Stick to one way of showing the extension and allow the user to choose where they want to see it – as an icon in the toolbar, on the bottom right, as a right-click extension and so on. One bad example Justin showed was the Delicious extension which adds 7 logos to the Firefox chrome in different areas. Build fast add-ons. Your add-on should not delay the start up of Firefox. Mozilla are working on tools to measure performance and tell developers how to change them. Next up were some of the ideas how to market your add-on. Pretty basic advice but surveys in the community showed that these things constantly get done the wrong way. The name of your add-on should mirror the functionality – don’t get too creative. Avoid EULAs – Firefox now has different install buttons for EULA and non-EULA add-ons. Surveys showed that 44% of the plugins without a EULA got installed, but only 5% of those with a EULA. Another 40% of the installers dropped out after reading the EULA which means that only 3% got installed. Next up was Myk Melez with a deep dive on Jetpack. 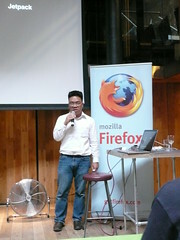 He started with a history and description of Jetpack which came from the Mozilla Labs. The reasons for Jetpack were that it was too hard to build add-ons, that browser updates broke add-ons, that restarting your browser is annoying and that add-ons have system access but probably don’t need it (which of course is a security issue aswell). Jetpack came around in Spring 2009 and had these features but still allows for full system access. People liked it a lot, especially that you could build add-ons inside the browser which is great for casual developers. There were however some issues with bootstrapping into Firefox and compatibility with updates and there was no way yet to harness third-party APIs in your extensions with Twitter being the most requested. 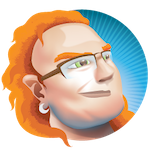 In Fall 2009 there was a reboot of Jetpack which included a web application for casual developers, an SDK for developers, XPI bundles + API bundled with add-in to solve bootstrapping and CommonJS Modules for code sharing with third parties. In 2010 the webapp and SDK came out as a incubation programme of Mozilla instead of labs level and after five SDK releases, Jetpack is now restartless on 4 and betas, has a unit testing harness and documentation tool. The web app allows you to create add-ons and libraries and instant testing via a helper add-on. Myk then did a live demo building a new extension using the of the add-Ons Builder (which is Bespin inside the browser allowing you to build extensions). The future of Jetpack will have the limiting of system access, new APIs for window and sidebar, debugging options (console and memory management), compatibility across updates and the web app will get addons.mozilla.org integration. You can read all about Jetpack at jetpack.mozillalabs.com and try out the builder yourself at builder.mozillalabs.com. After a quick break with awesome food and drinks (really) we headed for some lightning talks. First up was Evgeny Shadchnev showing his Invisible hand price comparison Add-On. Specifically he explained how they moved from XPI development to Jetpack and how the test driven design allowed them simple development in a way no other browser extension platform does. 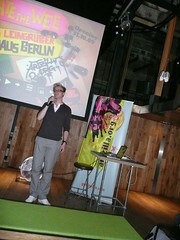 Next was Tobias Leingruber from Artzilla.org who talked about the lighter side of add-on development and hacking the web to be a funnier and more interesting place. I loved the talk as I myself have this mean streak for my add-ons (check Touretter as an example). Tobias talked about things artzilla had built, like a Dislike button for Facebook, the China channel firefox add-on that simulates the internet censorship in China and an add-on that finally removes Justin Bieber from the internet – thanks guys!. Brian King talked about building add-ons for Firefox Mobile and pointed out the slow performance on handsets, the need for a different UI and how you can build cooler add-ons as you can tap into orientation, gps and camera. He also explained that you don’t need a phone to develop as there are nightly builds of desktop Fennec and a Maemo virtual image for Maemo apps (simulating a Nokia N900). One big tip was the Addon collector extension which allows for bunch syncing on extensions from desktop to mobile. 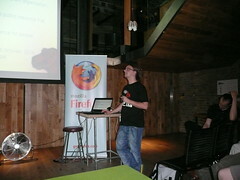 Paul explained that the Firefox UI is a big web page. Firefox itself is XUL and you can open it in Firefox itself with chrome://content/browser/browser.xul. He then showed how to build a browser in XUL using the XUL explorer in 20 lines of XML. Once you understood that the whole browser is a XUL document, the next step is to understand Overlay which means that you add to the browser’s chrome. You can find out where to inject your code using the DOM inspector. All you need to do then is to write a manifest file and an install.rdf and package up your extension. All of this is described in detail at https://addons.mozilla.org/en-US/developers. the plugin caused an issue. Tristan re-iterated Mozilla’s cause and idea of the web as an open and free platform and that they are working hard to make it easy for developers to build with free tools what has been done with closed source platforms up to now. Green screen technologies in images and video by detecting pixel colours. 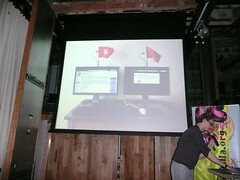 Websockets controller running the presentation from the mobile. I had a great time at the event and I am convinced again that Mozilla are doing a great job in building the infrastructure for the Open Web. If you think only webkit is an HTML5 browser, check out some of this. 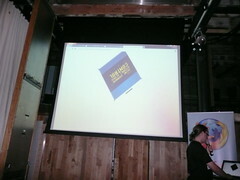 One of my favourite parts of the whole demo at the end was that all of the examples are progressively enhanced, so if you watch them in a browser that is not Firefox you still get the features supported in that browser – something that the Apple showcase of HTML5 for example doesn’t bother to do. 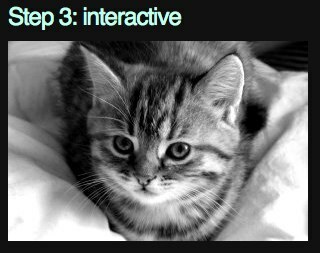 Chasing the shiny – HTML5, CSS3, transitions – oh my! Yesterday I had a back and forth on Twitter with Paul Irish and Divya Manian on Twitter about a thing that is full of win but also drives me crazy. In essence this is the designer’s eye for http://caniuse.com/ which listed the same information in a lesser visual but very useful manner. When I looked at the visualisation I went “WOW” and so did a lot of other people. But actually when using the site my fascination and interest quickly disolved. I have no clue why the ray is coloured differently. I might think it is the connector between HTML5 and CSS3, but Geo Location is not part of HTML5. The next thing I normally do to any interface is to turn off CSS to see how it degrades for non-visual users or on old mobile devices (yes, I do have to use an old Blackberry from time to time). 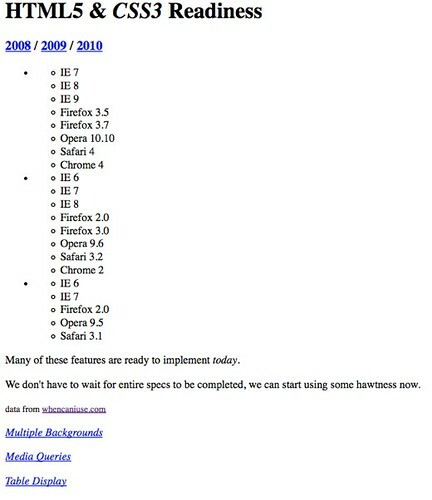 There is no connection between the year names and the browser support (other than links – a nested list would make the connection much more obvious). None of the links (like “Multiple backgrounds”) does anything. OK, I get it – I and B are text stylistically offset from the normal prose without conveying any extra importance> which technically gives us a carte blanche to do whatever we please with these elements. Back in the real world, however, WYSIWYG editors have B and I buttons which include these elements as BOLD and ITALIC. Now, as accessibility and semantics fans we’ve been bickering for years that this is a bad idea as this is painting with HTML rather than telling a user agent that the text needs to be emphasized or strong. We made quite some headway with this – and people started listening to us. Now we go back and say “oh well then, actually this is all fine – use whatever you want”.
.: the very best of :. Wow, terrible, right? Who would use tables for layout? This is madness – these are technologies we shouldn’t need to use any longer. Or is it? 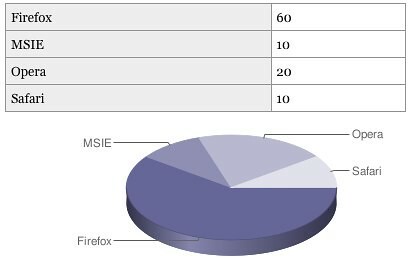 By using the plethora of HTML elements in the visualisation above we do exactly the same thing! HTML is there to logically structure content and give it semantic meaning – not to paint lovely pictures. I am not saying that Paul and Divya did something bad – I am big fans of their work – I am just saying that we keep doing the same mistakes. If you would not write some HTML by hand and only need it for an effect – you are doing things wrong.